I’m back with yet another non-traditional review of sorts this evening. A few posts back, I got into a discussion about our photos, and how they act as the comic book panels of our lives/days/years/etc. That post struck a chord with some readers, and I received some great feedback about how thoughtful that post was. If you did not get a chance to read it, check it out here. I also recently, and prematurely, stated that my next 365 would revolve completely around food, and while that will be part of it, as I enter the last lap of my journey, I’m realizing that I’m more interested in storytelling in general, and as the thoughts of what I want to do next year pull me in several different directions, I think it’s safe to say that I will center my energies in the idea of storytelling as a whole, and that means a number of angles including food posts, more graphic novel reviews, restaurant reviews, the start of my own web comic journey, etc. Working title: Storytelling is Not Dead. A title that I took from the only poem I have ever to read at a poetry open mic…a story for another time. This weekend is my birthday and my wedding anniversary, so by accompanying my wife to an amazing dinner with a couple of her friends, I have decided to make this Wednesday the official start to the Birth-a-versary Weekend! And with that, I’d like to discuss my trip to Parachute. Parachute Chicago is run by the husband and wife team of Johnny Clark and Beverly Kim. My wife and I became a fan of Beverly Kim from the television show Top Chef. 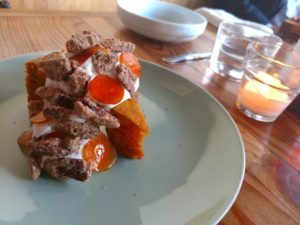 We actually had the chance to visit her a few years back at aria in Chicago where she was the Chef de Cuisine, and now we hit up the fabulous Parachute when we crave some amazing high-end Korean-American fusion. I tell you this to show that while I have only met Chef Kim once, and visited her restaurants a few times, I have a story to tell, and the food I have had, also tells stories. I wanted to speak with Chef Kim this evening. I wanted to ask her to tell me a story about one of the dishes on the menu because I’m sure some of the dishes themselves have intricate and rich stories. 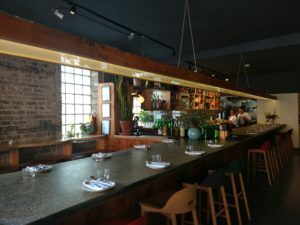 I did not get a chance to speak with her, but Chef Kim, if you read this, I would love to hear a story or two from you for my next 365 about a couple of your amazing menu items! At Parachute, me, Kori, Michelle, and Yu-Chi built our own 120-minute story. We flipped through menus, ordered drinks, discussed allergies, conversed with servers, and enjoyed each other’s company. The story might not be one that is made into an AMC series, but a story it is, and the food dictated the arc. While it would be weird to share photos of our conversation without thought and/or word bubbles, it is easy to share photos of the actual food, and when food is presented as art, it’s easy to get caught up in the documentation of that art. For example, here are a few shots of dessert. The first two are of an amazing carrot cake. The one without Yu-Chi is a simple “Hey, here is some carrot cake” shot, with the cake slightly off to the left of the panel to add some movement and perspective. 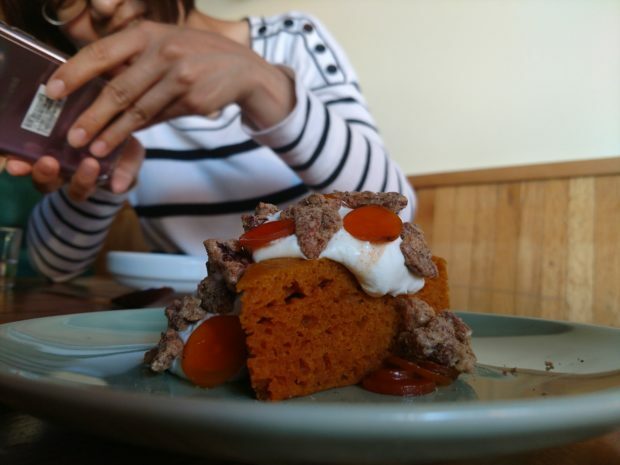 The pic with Yu-Chi says, “Hey, I’m with people” and the photo of her taking a photo makes my photo a bit more silly with multiple people taking photos of the same dang piece of carrot cake. Same cake, different stories. And the panna cotta is just beautiful! 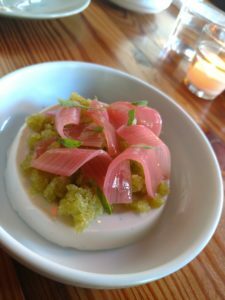 I encourage you to check out the menu for Parachute Chicago here. 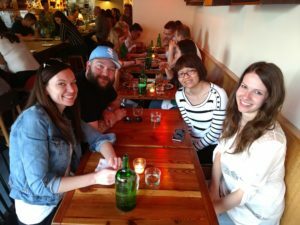 I have lots more photos and stories from dinner, but we are running out of time…already at almost 700 words as I write this. Summary: stories are everywhere; don’t forget to find them; food brings people together; what do your photos tell you about the graphic novel of your life?